The thought of trying yoga can be very intimidating to many people. They think they are too inflexible to start a yoga practice. I’m here to tell you to put those fears aside and to try yoga, because yoga will enrich your life in many ways, both on and off your mat. Here are five major reasons why you should try yoga. 1. You don’t have to be good at yoga to start practicing yoga. Many people are afraid to try yoga because they envision being judged by other yogis as they attend their first class. What you need to remember is that every yogi went through the same thing when s/he attended his or her first class. Also, as a whole, yogis tend to be very kind and encouraging and definitely won’t be judging you if you need to take a break in child’s pose. 2. Yoga teaches you how to listen to your body. Yoga teachers (and many good fitness teachers as well) will encourage you to listen to your body, first and foremost, and to modify poses if you need to. Honoring your body is one of the most important things you can do gain and maintain your health. Spending time listening to your body while practicing yoga teaches you to listen to your body throughout your daily life, which is a wonderful skill to have. 3. Yoga teaches you to be present. In our increasingly digital lives, it’s easy to disconnect. It’s also easy to fret over what we have to do later today or this week, or perhaps to obsess about saying the wrong thing to the wrong person. A good yoga practice will teach you to set aside those thoughts and worries and to instead focus on being present in the moment. This is another instance where you can bring the fantastic lessons you learn on your mat to your every day life. 4. Yoga helps you use your breath to stay calm. Yoga teaches you how to use your breath to get through tough and/or stressful situations. On your mat, you focus on your breath to get you through tough or uncomfortable poses. In daily life, we can come to our breath when things feel out of control or when we are in an uncomfortable situation. By coming to our breath, we remind ourselves to stay present and that we can be in control of our thoughts. 5. Yoga teaches you to be okay with who you are. Yoga reminds us that every day is different. You may have been able to easily hold an asana (pose) one day, but you struggle to stay in the same pose the next. Knowing and accepting that every day is different allows us to be kinder with ourselves when we’re having a tough day (or week, or month…). It also reminds us that although this day may not be what we expected, there is always another day after it and we have many opportunities to overcome setbacks in the future. My biggest suggestion if you want to try yoga but you’re hesitating: just go out and do it! 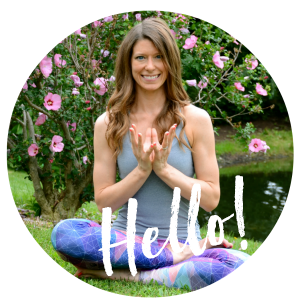 If you want to try yoga at a studio, check out my tips for attending your first studio class! Yogis: What’s the best thing you’ve learned from your yoga practice? What lessons from yoga do you take off your mat? The poses that I like the least are typically the ones I’m bad at. The reason I’m bad at them is because I am weak in the area that that pose will (eventually) strengthen if I do it enough. So I actually need to do MORE of the ones I don’t like, rather than more of the ones I like. And even if you think you’re not “enough” of something to practice yoga, your yoga teacher and other students in the class don’t think that! We’re much harder on ourselves than anyone else is. Hope you give it a try sometime! I love that we both wrote about yoga today! I am missing my vinyasa teacher, I think I will go see her this weekend! Great minds think alike, huh? 🙂 Hope you can get to that vinyasa class! Yoga is such a big part of my training! I’ve been practicing yoga almost as long as I’ve been running (close to 20 years). Yoga helps me balance both sides of my body, it makes me strong, it stretches me out! I’m sure not flexible but I think I’d be a lot less flexible if it weren’t for yoga. Those are all great reasons to practice yoga! 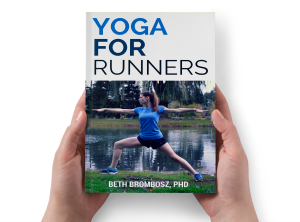 I’m sure I’d be a lot less flexible without yoga–running really tightens things up! Thank you for this post, I needed it. I used to go to yoga nearly every day, for years. Now I haven’t been since I moved from LA to Berkeley back in June. I really need to get back to my practice. I have gotten to a mindset of thinking of yoga strictly as cross training for running, and I have forgotten the mindfulness and peace that exist on the mat. Thank YOU for your kind words! I hope you can get to a yoga class soon–I’m sure there are some great studios in Berkeley!